One day while browsing the web to find bronze watches, I ran across a brand that I had never heard of, but with one attention-grabbing watch – the TC-9 Bronze Diver. Before we get to the watch, a quick history lesson on what TC-9 signifies. The Tropical Cyclone (TC) rating system is for measuring how strong a storm is. In that scale, TC-9 means its time to batten down the hatches, and hold on to your hats. Toby Cearns – the man behind the TC-9 brand – chose this name to honor the role that Hong Kong and the nearby cities of Shenzen and Guangzou play in the micro brand watch world. Though I had not heard of them before, Tc-9 is not new to watches. They started out as a full service watchmaker shop located in Basel, and more recently started producing their own watches. Currently, they have three models: TC-9 Pilot Watch, TC-9 1970’s Bronze Diver, and the 1950’s Divers Watch in Brass. 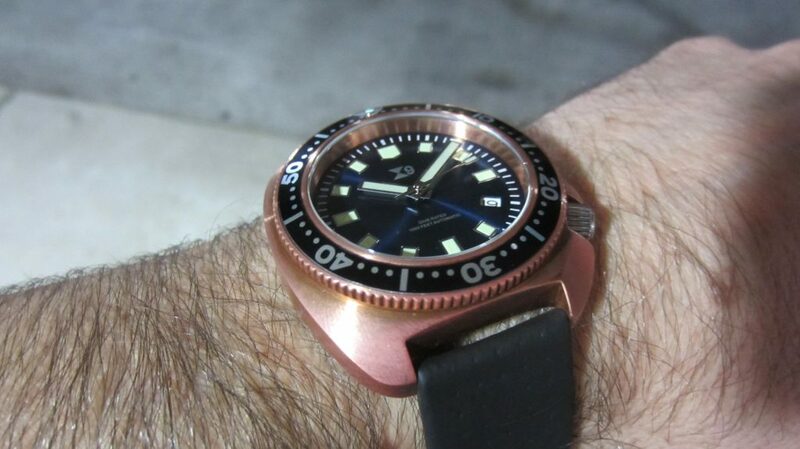 I reached out to Toby and he was kind enough to send out the 1970’s Bronze Diver for me to review. This model is inspired by the Seiko 6105 diver from the 1970’s. Let check it out. This is a simple 3-hander with the date at the 4 o’clock position. TC-9 offers dial colors in blue, green, and black; we looked at the blue sunburst dial. The hour and minute hands are large and blunt and the seconds hand is a thin paddle type, running across large blocks for the hour markers. All the elements of this dial bring out that original Seiko design. Topping it all off, you have an AR-coated sapphire crystal. The case design looks exactly like the Seiko 6105 dive watches that were made from 1968 to 1977. The big difference with this watch is that bronze case, and what a nice look that is. Measuring in at 44mm wide, 48mm lug to lug, and 13mm thick, this is by no means a small case, though it fits nicely on the wrist. The crown is located at the 4 o’clock positions with flared crown guards that are a natural profusion on the case. Around back, you have a screw down case back with sapphire crystal showing the Seiko movement inside. Water resistance is a respectable 1000ft (editor’s note: quite surprising given that exhibition crystal) which covers all types of recreational diving and some commercial diving. Then again, serious divers are going to be relying on a dive computer, not this bronze beauty. This TC-9 comes with a Seiko NH35A Automatic movement, which could not be a better choice for a Seiko-inspired diver. While it is a simple (read: undecorated) movement, there is still plenty to look at through the caseback. When you order this watch you can choose from 3 different aluminum bezel inserts. You can choose from a decompression dive table, minute counter, or GMT. While not quite full-on custom, it’s nice to have these choices. The bezel itself is a 120-click unidirectional bronze bezel. As one would hope, it has nice, solid movement with little play. A lot of Superluminova paint was used to fill in those larger makers and hands. This resulted in a nice strong glow that lasts. Night time or underwater legibility is no problem with this watch. What I’d change: Would like to see a bronze buckle on the strap. Materials: Solid bronze with stainless steel crwon. Strap: Di Modell German hand made strap. Calf leather but water proof vintage style divers strap with stainless steel buckle. And also free additional leather strap in Ox Blood Red.